The City of Montreal asked motorists to take their time on Thursday. If possible, stay home until conditions improve, the city said. Rainfall and icy roads made for treacherous driving and walking conditions in Montreal and throughout the province on Thursday. Pools of water coated many roads and sidewalks. The temperature was expected to drop once again, later Thursday. "The conditions are extreme. We're doing our best to clean the sidewalks and scrape the sidewalks," said City of Montreal spokesperson Philippe Sabourin on CBC Montreal's Daybreak. He said city workers were out spreading salt and abrasives. If you do have to go out, the city asked you to take your time, as the accumulation of water on the roads could lead to hydroplaning. "We're asking everyone to be very careful, be civilized, slow down," he said. Urgences-Santé says it received 20 per cent more calls than usual, Thursday afternoon. The ambulance service asked people not to call 911 unless it's a life-threatening emergency. Those who are sick or have a minor injury were asked to call Info-Santé at 811, or take a taxi if they needed to go to hospital. As of 3 p.m., 120 ambulances were out on the roads in Montreal and Laval. 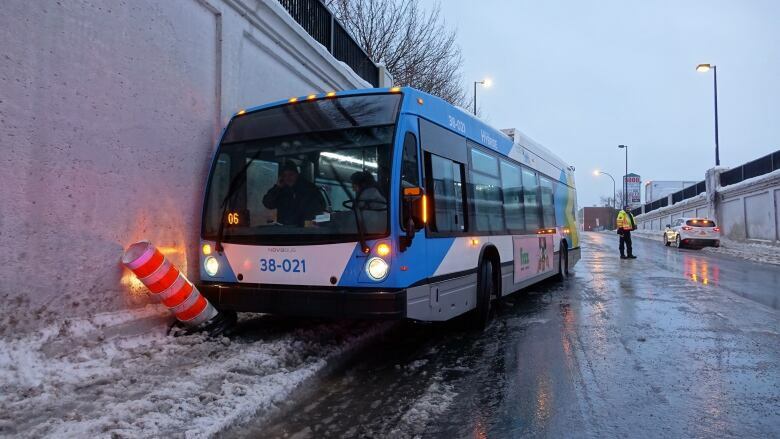 Urgences-Santé says it received 70 calls about slips on the ice at around 3 p.m.
An STM bus slid into a wall on Iberville Street near the corner of St-Joseph Boulevard. No serious injuries were reported. Dominic Prefontaine said his drive time from Boucherville to downtown Montreal was tripled this morning. "It was not slippery but there was a lot of water accumulation," he said. "The ground is frozen so there's no place for the water to go." It took him about 80 minutes to get to work. 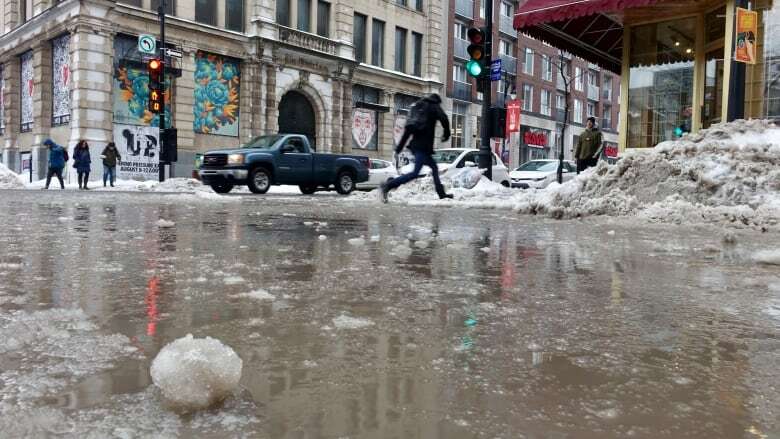 Montreal Mayor Valérie Plante said on Twitter that the city is prioritizing clearing sidewalks, unblocking roadside drainage and spreading salt and other abrasives. She said the city will continue to evaluate the situation as the weather changes. 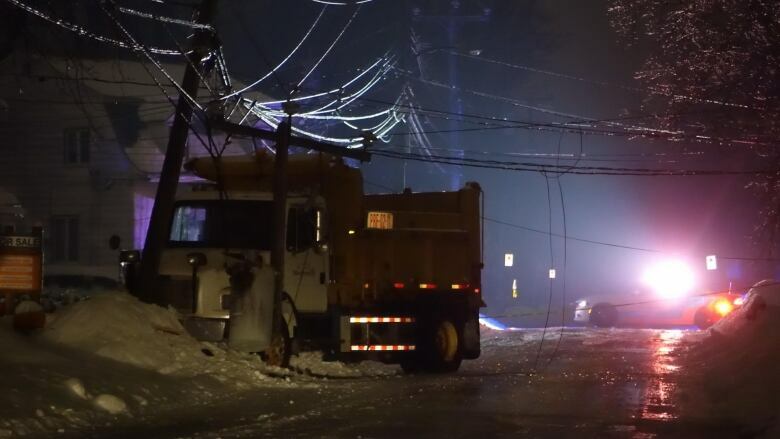 A city truck sliding into a hydro pole around midnight on Gouin Boulevard left thousands without power in Pierrefonds overnight but has since been restored. The driver was taken to hospital with minor injuries. Power had been restored by Thursday afternoon. Meanwhile, the Eastern Townships experienced flooding due to the rainfall and melting snow, and freezing rain battered the Quebec City region. A total of about 26,000 Hydro-Québec customers were without power throughout the province as of 3 p.m.